This tangy pulled chicken just takes a few ingredients and some time in the slow cooker for a deliciously sweet and tangy sandwich. Perfect for weeknights and busy nights! 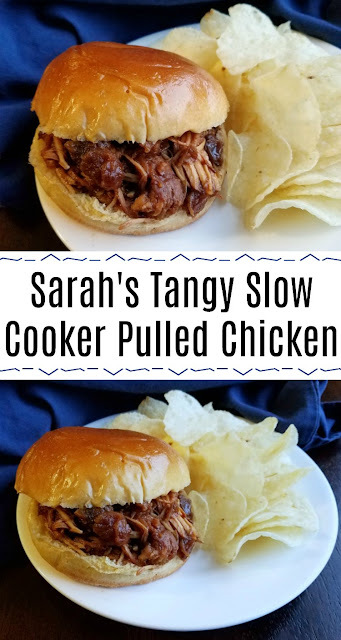 This is the last of Sarah's slow cooker meals from the make ahead slow cooker week! It is a tangy chicken that uses cranberry sauce and BBQ sauce. It is a really easy recipe. Just throw everything in the slow cooker and let it go. Shred with forks, put on buns and enjoy! She also gave us the salsa chicken recipe we use all of the time for burrito bowls. 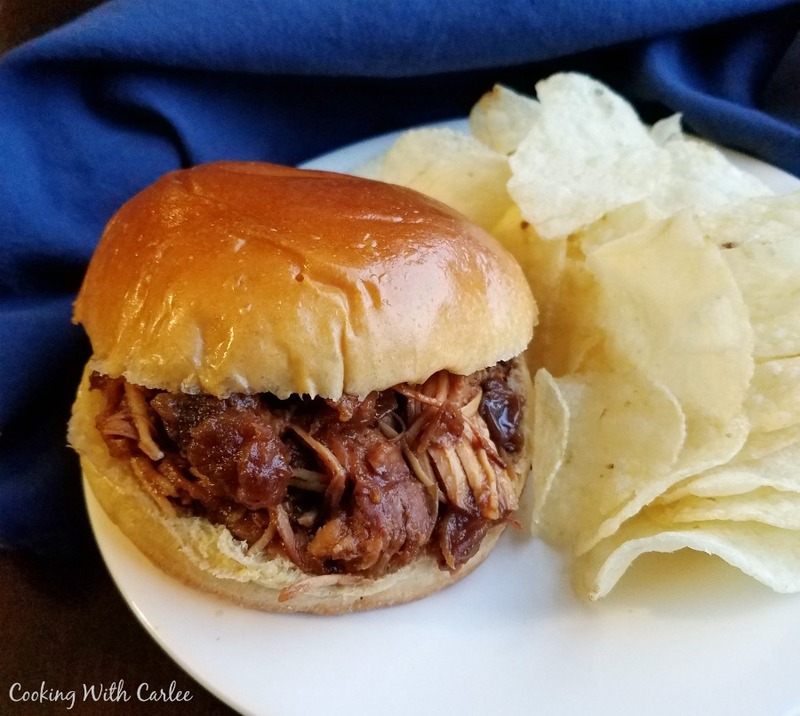 This recipe is super quick and easy. 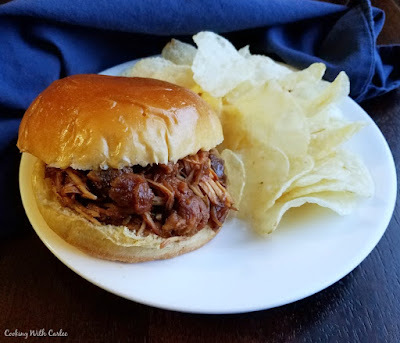 Five minutes of dumping ingredients into the slow cooker before work and a few minutes pulling the chicken and piling it on buns is all it takes. We love coming home and having dinner ready and waiting. What are your favorite meals for busy nights? Okay. So I'm thinking yum when reading Sarah's recipe and then it happened. I saw the homemade rolls. They look like the have a crispyish crust. PLEASE SHARE THE ROLL RECIPE. They do have a really nice crust! It is an easy recipe Anthony told me about when we were in Chicago last weekend. And did you say "quick" homemade rolls? Seriously? Now I really want to make them. It's 5 minute a day artisan bread. Which is a little deceptive, but there is no kneading and the dough is good in the fridge for two weeks. Anthony makes himself a couple of rolls at a time. 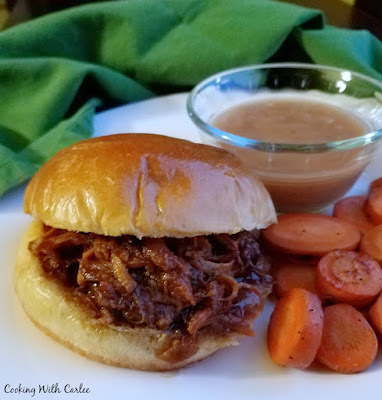 I've never tried cranberry sauce with BBQ sauce, sounds delish! I second, or third the request for a quick roll recipe! ;) Have a great weekend Carlee! This was my first time making them! I made a batch of dough and made these rolls one night and used the rest as pizza dough the next day. I will have to play with it a bit and then I'll post a recipe. You have a great weekend as well! I love slow cooker meals and this one looks amazing! And I'm with the other commenters…share the roll recipe! They look fantastic too! I will work on them a bit and share them. This was my first time making therolls!